Think about “Party”, Tourist both of Thai people & foreigner recommend "Full moon party" at Koh Phangan. This is world-famous seaside party which is held every 15th day of the full moon. The party is set around seaside with drinks and music all night. 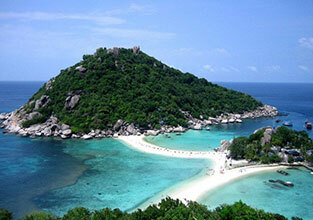 Koh Phangan is not famous only in “Full Moon Party” but also beach is very beautiful and richness green forest. Activity of Koh Phangan has diving, hiking and seeing lifestyle of fisherman. There are many corals and biodiversity in the sea of “Koh Tao”. 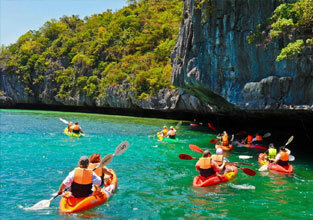 Tourists can go diving shallow and deep water, walking around the beach, see the sunset and paddle Kayak. 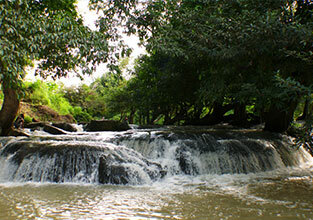 Vibhavadi Waterfall has origins from “Dan” massif and flow “Klong Pai” river. This waterfall has 9th levels which each level is very beautiful. 2nd Level of the waterfall has pond for splash and around the waterfall is preserved forest area. Most of tourists like go to relax. 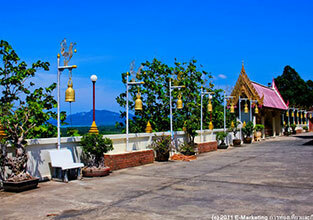 “Wat Khao Suwan Pradit” is a temple on the hill in Donsak district. This temple is created by Phra Kru Suwan Praditkan or Luang Phor Choi, Famed Monk of Southern in Thailand. Curently, He has died but his body is in the glass coffin inside chapel. Pagoda where is the Buddha's relics is on hilltop. Koh Samui is a travel attraction place in Thailand. It’s world-famous island because it has beautiful natural, white sand on the beach and fully facilities such as comfortable transportation and much more accommodation. Khao Sok National Park, Tourists call “Guilin of Thailand” It’s valley rain forest where has a wonderful waterfall, cliffs, many limestone mountains. 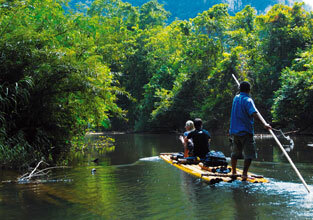 Khao Sok National Park is attraction for tourists where is many people wish in one day, have to go. Beautiful sky, many animals and clean air. It makes this place cozy. Rajjaprabha Dam reservoir is in Khao Sok National Park. We recommended for tourists who loves marine tour. 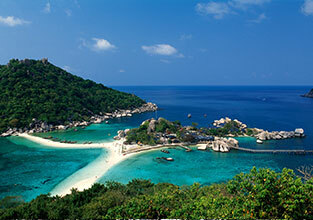 Angthong National Marine Park consist 42 beautiful islands. There are many tourists attraction where can see many islands, white sand on the beach and blue sea. This place has Koh Wua Tha Lup has a water cave where is short stream. Tourist can see rare plants (called Paphiopedilum x Ang-Thong). When you walk to viewpoint, you will see the sea surrounding bymountain and all green plants. Moreover, almost the island has corals around the island. It makes you feel unforgettable.